Начало » SUPPORT FOR THE FUTURE of every CHILD! SUPPORT FOR THE FUTURE of every CHILD! The center caters for over 40 children with special needs/disabilities. The main purpose of the service is to support the individual development, by learning and sustaining of new abilities for children with different types and degrees of disabilities. We support individuals from different ‘at risk’ groups through targeted activities for integration and prevention of social exclusion. The service includes a variety of counseling, therapeutic and rehabilitation activities aimed at creating, maintaining and expanding social skills, as well as learning to live independently. Therapeutic, consultative and rehabilitation activities are carried out by specialists who assist and support service users and their family through individual and/or group activities. Children use activities and programs (individual or group) hourly – every day or several times a week or month depending on their individual needs. Children with sensory impairments visual or hearing. The purpose of the psychological intervention is to direct, support and encourage where necessary. It helps the children to understand how to behave more appropriately in the family, school and kindergarten. The special needs teacher will deal with the sensory development, cognitive development, literacy and correction therapy through play. Stimulates the child to understand their body and the environment around them. Creates opportunities for self-discipline to accomplish activities of everyday life. Develops abstract thinking, cause and effect and advice on relationships through appropriate models. Develops concentration, attention, constructive thinking, memory, and other psychiatric processes by collaborating with the psychologist and the G.P. The speech therapist helps children with speech difficulties to learn to speak, correct articulation and respiration and provides alternative communication methods for those children who are unable to speak. They begin with a speech diagnostic program which helps to determine the client’s linguistic development and communication skills. It assesses the level of speech and linguistic development, oral and other sensory disorders and highlights abnormalities in speech and communication. Through this diagnosis the speech therapist will be able to implement a suitable regime to help and support the child to communicate more effectively. Priority is given to individual training, then to group sessions in order to improve the opportunities for communication. Art therapy uses creativity to help children and adolescents get in touch with their feelings and desires. The process of drawing, writing or other creative activities provokes the activation of the psychological energy, which helps to promote emotional recovery. Art therapy can improve verbal communication and redirect the desire for expression into other productive forms. Using painting as an example, the theme of the drawing, the size, the colors, the shapes and even the pressure of the brush or pencil are important. The specialist, after assessing the needs, decides which art to use or to alternate several forms according to the preference of the child or young person itself. Music and other creative arts also have a very positive impact on children and young people. Hygiene – teaching basic hygiene in the home etc. Housework – teaching ironing, washing, vacuuming, dusting etc. Gardening – teaching general knowledge and care of flowers and plants, watering, planting etc. Creative activities – knitting, sewing, embroidery etc. Also includes: hobbies – reading, writing etc; art therapy – pictoral and creative activities; working with clay; making invitations and cards; creating sensory games from different natural tactile materials; woodwork – basic concepts such as measuring, forms, shapes and colors. Counseling and information is provided individually or in groups. It is carried out in a specially prepared environment, according to pre-developed programs and plans, depending on the needs of the client. Parental training programs – to increase parenting skills and improve the understanding and care for the disabled child. Organizing and conducting information campaigns on various topics related to children and young people with disabilities. Printing leaflets and brochures on specific issues addressed to the community or professionals working with children. 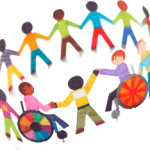 Organization of events aimed at the general public or individual professional groups on specific topics related to the social inclusion of children and young people with disabilities. Involve service users in different municipal events and initiatives. Advocacy, escorting and assistance of children and families to different services.